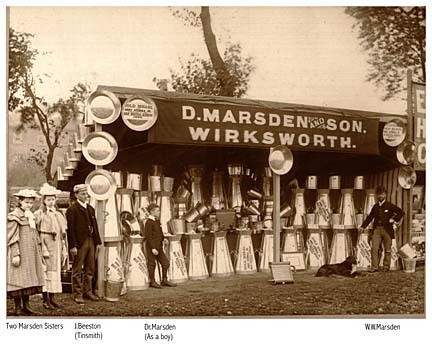 Two Marsden sisters, J.Beeston (tinsmith), D.R.Marsden (as a boy), W.W.Marsden. Thanks for directing me to the photos I can give details of the people in the photos and I am particularly interested in the Dr MARSDEN (as a boy) Daniel Roper MARSDEN. in 1891 he's a scholar in 1901 he's age 19 and an ironmongers assistant. Do you know how he got the title Doctor? I think it's more likely D.R. MARSDEN! I have the family tree going back to Godfrey MARSDEN b 1755.d 1833 age 78. Alice Ann c 20 May 1877 d 25 May 1975 aged 96. Ann Maria c 9 April 1879. Dr? (D.R.) MARSDEN (as a boy) is Daniel Roper MARSDEN c 21 Sept 1881 d 22 june 1957 aged 75 married Mary Rebecca ? who died 5 Jan 1952 aged 69. Daniel was a scholar age 10 in 1891 census and an ironmonger's assistant age 19 in 1901 census. W.W.MARSDEN is William Wesley MARSDEN c 7 Aug 1853 d 2 Nov 1932 age 79 married Ellen or Helen Maria ? in 1875 she was a millener and dress maker and was b 1854 d 6 Sept 1898 age 36 He married again to Nancy ? and had one Daughter and again to Catherine and had two daughters. I have a family tree of the MARSDENs going back to Godfrey MARSDEN b 1755.